We are under way today in the North Atlantic, bound for Cape Cod Bay and the entrance to the Cape Cod Canal. We had intended to be headed, instead, for Provincetown today, but mother nature had other ideas and we had to change plans, in a mad scramble to make our planned arrival date to Washington. Dinner time under way: Sunset Friday evening over a glassy North Atlantic. We very much enjoyed spending Wednesday evening with John and Gayle aboard their boat, Sirens Call, in Burnt Coat Harbor. 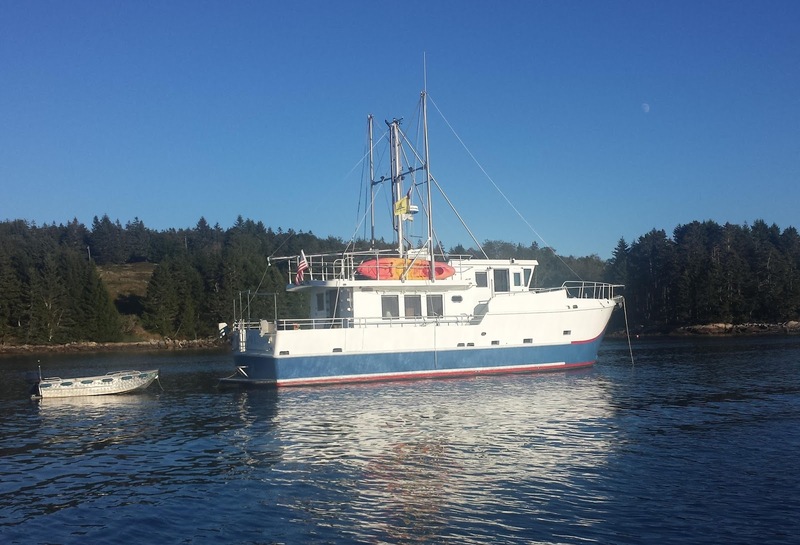 John designed and built Sirens Call himself; like Vector it has a steel hull and aluminum superstructure. It's a great boat, and we spent part of the evening comparing notes. We left with gifts of cooked crab and pounds of fresh local apples. Sirens Call, moored in Burnt Coat Harbor. Sharp looking boat. 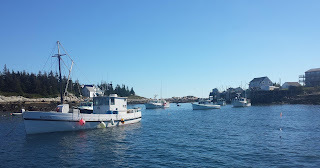 Thursday morning we departed on a favorable tide and proceeded west through Toothacher Bay and Jericho Bay, where the lobster floats are the densest we've encountered, and along a channel called "Merchant Row" among the myriad islands between Deer Isle and Isle Au Haut. We then turned south through Isle Au Haut bay and past the shipping lanes to Matinicus Island, well south of the bay and the southernmost populated island Down East. 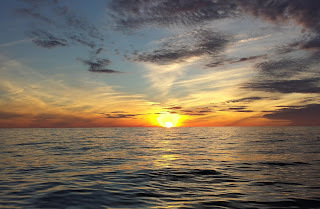 We had considered perhaps stopping at Isle Au Haut itself instead, but we opted to get a bit further south just to get a head start on the very long passage south to Gloucester, and have a bit more relaxing morning on Friday. We settled for enjoying the beauty of Isle Au Haut from the water as we passed fairly close by to the north and then west. 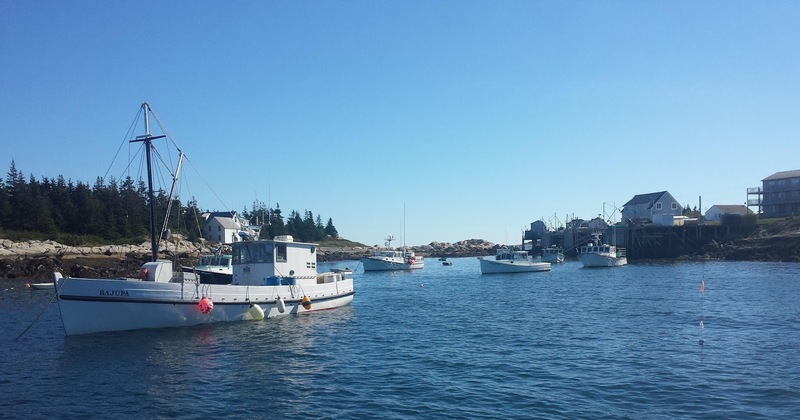 Matinicus Harbor is incredibly small and there is no room to anchor among the lobster boats. 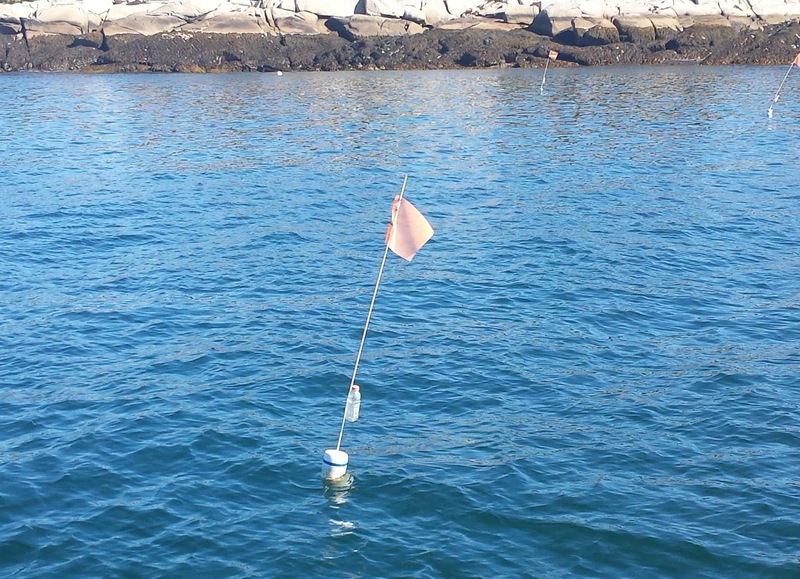 One of the locals has set out several guest moorings for visiting boats; attached to the float is a small bottle into which is put the $25 fee, and in which can be found a sheet of information about the island. We picked the mooring with the most room (map) and ended up just swinging past the next mooring float by a couple of feet. It was fairly calm in the harbor when we arrived. The moorings are tied to pot floats. The Gatorade bottle is where you pay the fee. There is nothing in Matinicus save for lobstermen and their boats. No stores or restaurants, although one resident runs a small bakery, and no tourism. Supplies come to the island on a ferry that arrives a couple of times a month. We had the crabs we got from Gayle for dinner, and homemade applesauce that Louise made from the batch of apples. I had hoped to go ashore in the morning to walk around a bit and perhaps get something from the baker for breakfast, but the winds clocked around overnight, and there was too much swell in the harbor to even splash the tender. We never left the boat. A working harbor. That's Wheaton Island on the left, Matinicus on the right. Unfortunately, we were also very much offline there. Our new MiFi struggled mightily and would occasionally get enough of a signal to get text emails (but not send them), and we were able to scrape a weather forecast together with patience. I had anticipated this, and we had sent our overnight float plan to our emergency contacts before leaving Burnt Coat, where we at least had more reliable low-speed coverage (not enough for web browsing, but enough for email to work). The forecast for our overnight passage was good, and we left Matinicus on the last of the outgoing tide Friday afternoon. While seas were perhaps four feet early on, it was a gentle, rolling swell of very long period. Even that flattened out over the course of our passage; it was never flat calm but the surface was glassy with very little wind. We also had considerable favorable current through most of the trip, which proved to be something of a problem. I had planned an arrival time of around 8am, which by itself required a very low cruising speed in order to still leave the harbor in good conditions. But over the first half of the trip the arrival time kept moving up, putting us in jeopardy of arriving at Gloucester Harbor in the dark. I kept throttling back until we were eventually running at just 1350 rpm, giving us our best fuel mileage ever. I spent the first two or three hours of the trip dodging lobster floats, but they became considerably thinner after fifteen miles or so. Even 30 miles offshore, you're never far from one; Louise had to dodge a group of them, fortunately sporting radar reflectors, in the middle of the night. We bid a very fond farewell to Maine, but we bid good riddance to its lobster floats. The passage was otherwise calm and uneventful. We passed a number of ferries, cruise ships, and tugs, all at a great distance, but never saw another pleasure boat. 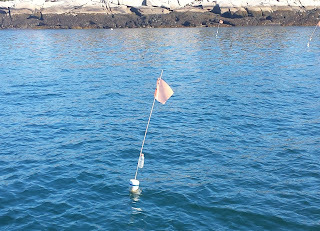 We modified our normal watch schedule to put me back at the helm for the transit between Thatcher Island and the shoals just east of it, marking our arrival at Cape Ann. Despite best efforts, it was indeed still dark as we approached the twin lights. Now back in denser lobster float territory, we had a few close encounters, with last-second dodges, before there was enough daylight to see them well. 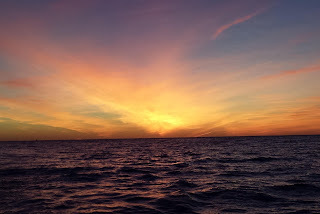 We enjoyed a beautiful sunrise just before rounding the corner into Gloucester Harbor. 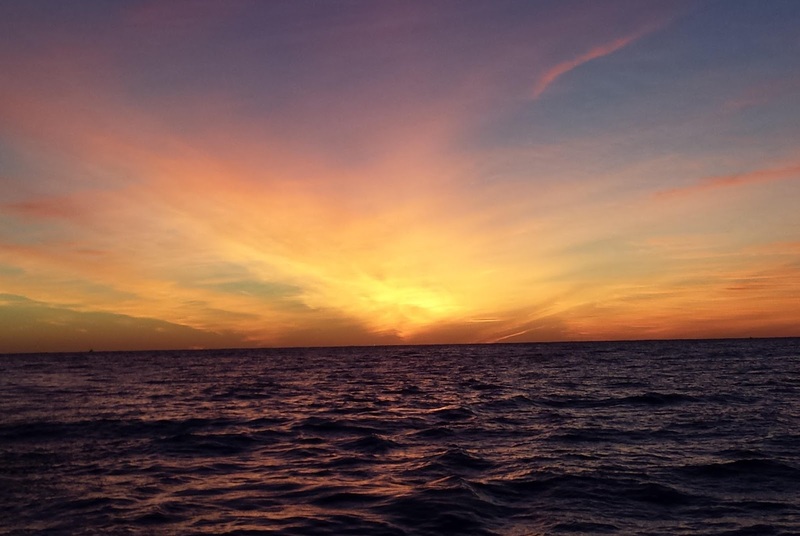 Sunrise from just off Cape Ann. This return visit to Gloucester was occasioned by a desire to fuel up before heading south. At just $1.90 per gallon, this is the best fuel price on the east coast at the moment, and we came into port with just 265 gallons (exclusive of reserves) in the tanks, down from our full complement of around 900 gallons. The fuel barge here is open from 7-12 on Saturdays. We pulled up just a little before 7am and they took us right in. It took a little over half an hour to take on 740 gallons of diesel. By 8am we were anchored in our old spot in the harbor (map) and fell into bed for a post-passage nap. In Gloucester, our MiFi had 4G coverage and was lightning fast, more so even than the couple of WiFi networks in town, and I hoped to catch up there on my backlog of emails as well as blog posts. Instead, after getting a couple of projects belted out, I ended up spending the whole afternoon and evening re-calculating routes after we pulled the latest weather forecasts. Our plan from Gloucester had been to cross the bay to Provincetown, spend a full day (two nights) there, and then circle around the east side of the cape down to Nantucket. I have not been there since I was a little kid and was looking forward to a return visit. There we'd spend another day or so, waiting on good weather for a two-night outside passage to Cape May and the Delaware Bay. The wave forecast for the coming week, however, has been steadily deteriorating. By yesterday afternoon it had become clear that if we went to Nantucket at all, we'd miss any kind of window to make the crossing in good conditions, and we decided to proceed with all haste via the most direct route, which involves transiting back through the Cape Cod Canal and through Buzzards Bay into Rhode Island Sound. When we went to bed last night, after some tasty burgers at the nearby Cape Ann Brewery, the plan was to anchor today at the east end of the canal, and tomorrow proceed through the canal and then directly out to sea on the two-day passage to Cape May. By this morning, though, the forecast had deteriorated even further, and it is possible that the window for a long outside passage has slammed shut. We will reevaluate tomorrow afternoon as we approach Block Island. There is a small chance we can still make the run, staying a bit closer inshore for better seas and more bail-out options. If we can't, our fall-back is to continue on the more protected route via Long Island Sound, New York Harbor, and Raritan Bay. That will get us a bit further along over the course of three days or so. That said, we will still be pinned down there until conditions off the New Jersey coast improve. At this writing, they look progressively worse after today and for at least the next week. If we can get even a one-day break, we'll grab it and make an overnight run for Cape May, even though on a coastal transit we'd prefer to run only in daylight and make a stop or two somewhere mid-state. The forecast has been very fluid; there is clearly something spinning up here in the North Atlantic, but the models don't all agree. I have my fingers crossed that by tomorrow afternoon we will find just enough of a window to make a run for it, but I am not taking any bets. In the meantime, I got some work done around the boat. Now that we are going so long between marina stays, laundry has become something of an issue. Water is the biggest problem; our older-style household washer uses 30-50 gallons per load. We've been able to deal with that by running the water maker as much as possible and then finding docks where we can take on some water as needed. The other problem is power. The washer/dryer, a stacked affair with a single electrical cord, is a 240-volt item. That means the generator needs to be running to wash or dry, even though most clothes washers are just 120 volts and would easily run from our inverter. We end up running the generator about two hours each day when anchored, but not contiguously; if we run it for the nearly three hours to get a single load completed, we'd still end up running it an hour again later in the day. The dryer is the real culprit here, and one way we deal with this is to hang the laundry on a pair of lines I installed in the engine room after we stop for the day. The engine room gets up past 100 under way, and if we hang everything right after we stop, it's all dry by the time the engine room has cooled down to ambient. For that strategy to work, we have to run the washer under way, which, heretofore, has meant running the generator when it's not needed for anything else (the main engine easily provides us with all the electricity we need). So any way we sliced it, we've had to burn a couple of extra gallons of diesel each time just to do a load of laundry. That still compares favorably to coin laundry prices or marina power, but it seems like a waste. Yesterday's project involved splitting the washer power from the dryer supply when under way, so now we can do a load of wash (but not run the dryer) from the inverter using nearly free power from the main engine. I was able to do this without modifying the washer/dryer by using a 30-amp DPDT power relay to supply 120vac inverter power to one side of the receptacle, only when 240-volt power is unavailable. I also picked up a 50' coax cable at the hardware store and ran the DirecTV output up to the helm station so I can watch some TV in between horizon scans while I'm on watch, and still sit where I can see and hear all the instruments. I'll get to see how practical that is on our next overnight passage. We should have good, if sporadic, connectivity from here all the way to Long Island. When we make a decision on the route, I will try to post again here before heading offshore.